A few weeks ago the Insider’s Marc Malkin reported that Star Trek XI producer JJ Abrams‘ wife Katie Mc Grath pulled off a last minute surprise party for JJ’s 40th Birthday. Guests (who varied from Don Rickles to Richard Lewis to the Tom Cruise himself) weren’t told where it was until just hours before it was to start. That story focused on the Tom/Katie/Suri angle so Malkin left something out, but he has sent it our way since we are all Trek XI all the time! Marc tells the Trek XI Report that in order to keep JJ from finding out about the party; he was told that he was going to a meeting with none other than William Shatner (Star Trek‘s original Kirk). Although that was just a ruse to keep Abrams from finding out about his party, it is intriguing that his people used a Shatner meeting as their choice for distractions. This is even more intriguing when one looks at the various comments being made by Shatner regarding Abrams and Star Trek XI. 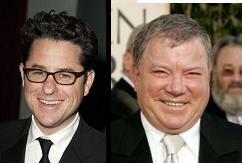 Are Shatner and Abrams talking? 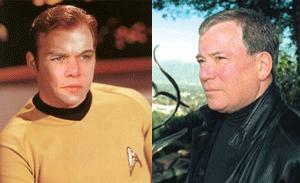 The buzz started when the Insider reported that Abrams had sought Shatner’s blessing to cast Matt Damon in the role of Kirk for Star Trek XI. Since then the Damon rumor has been all over, but so far JJ has refused any comment. Shatner on the other hand did tell the USA Today that he thought Damon ‘would be great’. This comment seemed like a confirmation of both the Damon rumor and that Abrams and Shatner were talking. However, a short time later there was a brief mention at StarTrek.com saying that Shatner denies he is meeting with Abrams. This week the Trek XI report contacted both StarTrek.com and the Insider’s Marc Malkin to try and clear things up, and both are standing by their stories and sources. Malkin is quick to point out that he hasn’t claimed Damon has signed on, only that JJ is interested and that Shatner is in the loop. Can all the reports be true? It is possible. ST.com’s editor suggested that Shatner may be acquiescing to the cloak of secrecy that JJ Abrams has imposed for Star Trek XI. He went on to say that they will keep an eye on the story and will update it when they learn anything. What would they be talking about? If there are indeed meetings, it is an intriguing question as to what they could be about. Perhaps they are just about Shatner’s blessing for Matt Damon playing Kirk. That seems to be something that could be handled in a simple phone call, but then again Shatner is Star Trek and Hollywood royalty so a face to face might be called for. There is a more intriguing possibility however…that of Shatner appearing in Star Trek XI. This is pure speculation, but it has been suggested that Shatner may appear in some kind of ‘book-end’ flashback type of way. A Shatner cameo would go a long way to satisfying many fans who want to see him one more time since his death in Star Trek: Generations and convincing any leftover fanboys sulking over Kirk being recsat. Plus Shatner is still a hot commodity, he was recently nominated for another Emmy for his work on Boston Legal and is even being roasted by Comedy Central later this month. For now, its all speculation…but we at the Trek XI Report will be on top of any new developments. Kirk (last seen 1994’s Star Trek: Generations) to live again?